I want you to imagine two people. The first man wakes up and does his usual routine before work, and it’s all a blur. He goes to work and when he comes home, he isn’t even really conscious of what he did. He starts eating the junk food he bought on his way home and watches TV while his wife tries to talk to him. Now imagine another man. He wakes up and tells his wife how thankful he is for their life. He drives over to his business and is passionately working to build it into something great. He comes home, and he and his wife have dinner together while they stay present to the moment with each other. Out of these two people, which one do you think is going to have higher self-esteem? The first pillar is the practice of living consciously. Lately, my hair has been thinning. What I haven’t done is this: “Uh, how come John’s hair isn’t thinning? How come John has better genetics? Oh and did I mention that John is also 6 foot 4?” Okay, the reason I haven’t done that is because, that’s a game you can’t win. I promise you. I don’t care who you are, even John can’t win that game. What I have done is what anyone who’s practiced building self-esteem in their life would do, and it is this: improve what you can change, and learn to accept what you can’t. Improve what you can change, and learn to accept what you can’t. Now let me address a common issue. There are people who think that self-acceptance somehow goes against self-improvement. It doesn’t. In fact, self-improvement can only follow self-acceptance. If I didn’t accept that my hair was thinning, I wouldn’t start researching what the right haircut needs to look like for me, and I would end up looking like Bobby Charlton. The second pillar is the practice of self-acceptance. I know a lot of people who are so physically unfit that it jeopardizes the most important things in their life like their health and their relationships. And when they get confronted about it, a lot of these people have learned a little trick that has been really trending lately. Apparently, everyone I know who is unhealthy is unhealthy because of a medical condition. Now, let me just be clear that I’m not saying that these conditions don’t exist. I’m just saying that 19 out of 20 of these people don’t have it. If you do not exercise, if you do not eat healthy, you probably shouldn’t be going around telling people how you’re overweight and unhealthy because of a medical condition. Yeah, they might treat you like you’re the victim, but guess what? The only reason they sympathize with you is because the last thing they care about is whether you’re taking care of yourself or not. The third pillar is the practice of self-responsibility. I don’t know of a single person who doesn’t take responsibility, loves playing the victim and also has high self-esteem. If I had a kid and I could only teach him one thing before he went to college, it would be how to stay authentic to his true self under pressure. Other than special occasions with my girlfriend where I’ll have some champagne, I don’t drink. I haven’t found that to be something of value to my life. When I was in college, I would go out with my friends and there was always that thing of, “Come on! Let’s get drunk.” And I was bad at a lot of things, but the one thing I was really good at was being really grounded in what I believed in. In fact, in almost every case it turned into guys having respect for it and girls being attracted to it. Now again, I didn’t say I sort of believed in it. It was fully standing for what I believed in, 100% unapologetic, and if that was a problem, everyone always knew I could just leave and go have fun somewhere else. I wasn’t half-assing anything. The fourth pillar is the practice of self-assertiveness. Now let me make it clear that asserting yourself doesn’t mean lacking social awareness or being pushy. I didn’t go to a party where I knew people would be drinking and start converting and preaching. Don’t be stupid with this, it depends on the context. I’m going to act a little differently if I’m in a classroom environment than if I’m around friends, but I’m not going to go against my authentic self in either situation. If you meet an entrepreneur who is passionate about his business, and if you also meet a person who is indifferent towards his regular job, the entrepreneur will almost always have higher self-esteem. Why is that? Because the entrepreneur is the modern day warrior. Just like the warrior has a strong sense of purpose and lives to conquer, so does the entrepreneur. He has higher self-esteem because he lives with a purpose. The fifth pillar is the practice of living purposefully. And finally, the sixth pillar – the practice of personal integrity. Notice how I said personal integrity, not someone else’s integrity. I went to a military academy and there were thousands of rules I had to follow, and I broke most of them and it didn’t bother me at all or affect my self-esteem in any way, because those weren’t the things that went against what I believed in. But, if I act against what I believe in, my inner voice will tell me how I’m worthless over and over again. And only I will know, but when it comes to self-esteem, my inner voice is the one that matters the most. You can’t have the voice in your head telling you how worthless you are and build self-esteem at the same time. 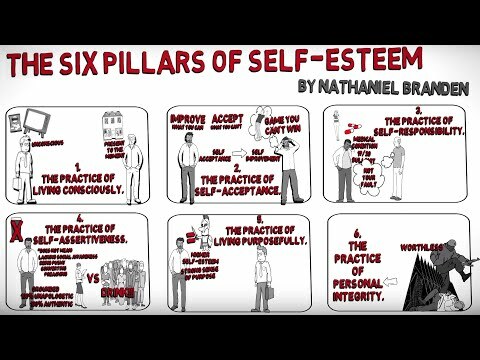 And these are the six pillars of self-esteem by Nathaniel Branden. Notice how each pillar starts with “the practice of.” Self-esteem is not something you build by reading a book or watching a video; it is something you build by constant practice for the rest of your life..